happy birthday was created for the weeMemories challenge #62 CAS. The stamps used are from Well Scripted and God's Beauty. 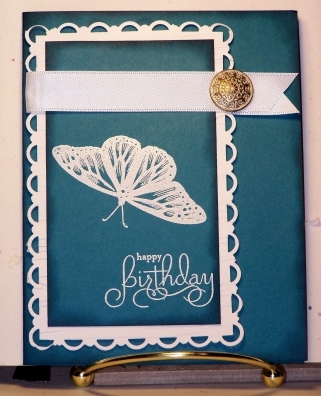 They were both stamped with Versa Mark and embossed with White embossing powder. I used the Scallop Trim Border and matching Corner punches. The cardstock is Island Indigo and Whisper White. Wow! I love that embossed white! Really pops against the blue!!! GORGEOUS! Thank you for joining us at Wee Memories this week!